All the authors are new to me apart from Emma Chase, so it was fun reading new authors and gauging their writing styles. This was my favorite novella in the anthology. This book is part of the Searching For Series. The protagonist are both clients for a matchmaking agency and are set up on a blind date. The thing is both of them have known and hated each other for the last 10 years.Ryan Dylan McCray and Riley Fox met in college where Dylan was the star who would party hard and still get the top grades while Riley worked hard all the time and was annoyed/hated that Dylan got the grades so effortlessly. Now they meet on a blind date which results in them being stranded in middle of a snowstorm. I really loved that both the characters were strong and independent and knew what they wanted from life and their future. Their banter was lovely & witty and their chemistry was very evident from the start. There’s something about enemies to lovers trope with all the hidden feelings hidden beneath the barbs and hatred that I can’t help but love. This book is part of the Love under the big Sky series. Grace Douglas is a very clumsy women whose friends decide that she needs ski lessons so she could ski with them on their vacation. Grace mistakes the resort owner Jacob Baxter as her ski instructor. Not wanting Grace to change her behavior towards him because of him being the owner, he decides not to tell her. 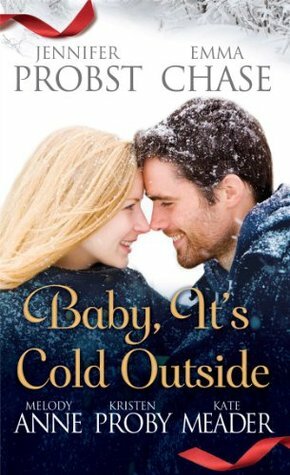 I enjoyed this one, it was sweet and romantic however the book should have been slightly longer so that both the characters and reader had gotten to know them more, especially about Jacob who we did not get to know much about. This was about a small town romance about two people who are completely opposites of each other; Hawke Winchester local fire cheif and a new to town primary school teacher Natalie Duncan. They get matchmaked by the towns busybodies who clearly know how to matchmake because Hawke and Natalie are good together. This was the longest book in the anthology hence the reason I felt it dragged or like nothing important was happening at times. Last book in the anthology is a reunion story of a couple who were in love as teenagers until they break up. Dracy Cochrane is the heiress-turned-tattoo-artist and Beck Rivera is the local fireman who also works in a bar. I know not sure how that works entirely but I’m not judging. When they were young, Brett broke off the relationship because he was the one with the bad reputation and did not want Darcy to resent him later on in their life for settling down with him. I found Beck’s apology or grovelling for breaking up young Dracy’s heart annoying. Some parts of this novella worked while others did not hence overall it was an ok read. Please note: I did not include or rate Emma Chase’s novella because I only read the first book in the tangled series, the novella is about the couple from it and hence I did not want to spoil the series when I did read the sequels. Happy Reading!